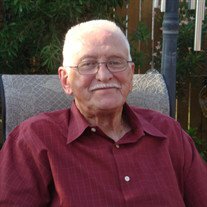 David Phillip Hall, Sr., 84, of Burnsville, went home to be with the Lord, Thursday, August 23, 2018, at the home of his daughter in Waller, TX. A native of Yancey County, he was a son of the late Carey E. and Addie Lee Robinson Hall. He was also preceded in death by his wife: Betty Hall; a son: David Hall, Jr.; a sister: Vera Hall and brothers: Claude and Carey Hall, Jr. David was a US Air Force Korean War Veteran. Surviving are his wife: Ruby Huskins Hall; a sister: Betty Jean Hall; a brother: Johnny Hall, all of Burnsville; two daughters and their spouses; a daughter-in-law; five grandchildren and their spouses; and, a great grandson in Texas. Funeral services and burial were held at South Park Funeral Home and Memorial Park in Pearland, Texas on Tuesday, August 28, 2018. A memorial service will be held on Wednesday, September 26, 2018, at 2PM, at Smoky Ridge Rehabilitation in Burnsville in the main dining room. This obituary notice a courtesy of Holcombe Brothers Funeral Home.